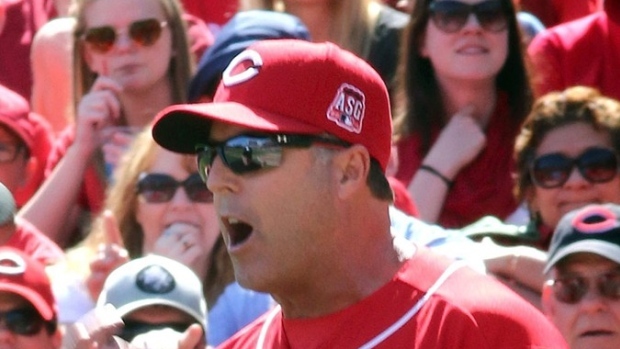 MILWAUKEE - Cincinnati manager Bryan Price is sorry for using foul language in a pregame tirade. Everything in between the bad words remains fair game. The Reds skipper stood firm on his stance that media shouldn't report developments he thinks would put his team at a competitive disadvantage. "I think probably before we get started it's appropriate that I acknowledge the events of yesterday before the game," Price told reporters before Tuesday night's game at Milwaukee. "I used a lot of bad language that I feel bad for in the aftermath. And I apologize for that. The content between the profanity is exactly how I felt, and I won't apologize for that under any circumstances," he added. "What I said was exactly how I felt. So what was your question?" Price apologized twice in the manager's office, once in front of TV cameras and again when the cameras were off. He looked reporters in the eyes during his apologies, which echoed a similar sentiment to the first apology of the day posted on the team's Twitter account. "While I stand by the content of my message, I am sorry for the choice of words," Price said on Twitter. The daily pregame meeting got a lot more heated before Monday's 6-1 win against the Brewers. Price was particularly upset over a Cincinnati Enquirer report that catcher Devin Mesoraco wasn't available to play during a game in St. Louis because of injury. The Reds confirmed on Monday that Mesoraco was in Cincinnati getting tested for a sore hip. Price also was upset the Enquirer reporter tweeted that catcher Tucker Barnhart was on his flight to St. Louis for the series on Friday, an indication he was being called up from the minors. Mesoraco, a power-hitting catcher, said Tuesday he was available to pinch hit if needed, though he wasn't sure when he might be able to return to full-time duty behind the plate. He hasn't played since April 12. Asked if Price's outburst could have any impact on the team, Mesoraco responded, "No, zero." The Reds had lost four straight and were scuffling through a 1-7 stretch going into the Milwaukee series. "I think this is the major leagues. If you need any more emotion to play better, then you ain't going to be here for long," Mesoraco said. Unlike the NFL, where coaches try to keep injuries more secret, Major League Baseball managers routinely tell reporters which players are available for a game. They will explain a starter is out of the lineup because of a minor injury but is available to pinch hit or a reliever is unavailable because he has pitched several consecutive days. Braves manager Fredi Gonzalez understood Price's message. He said before Atlanta's game Monday in New York the club has "tried to get ahead" of telling players about changes before they read them on Twitter and other social media. Gonzalez said a team could be at an advantage or disadvantage, depending on what extra information it might pick up. "He's dead on" except for the swearing, Gonzalez said. Brewers manager Ron Roenicke, known for an even-keeled demeanour, wasn't aware of all the details behind Price's comments but empathized with the Reds manager. "This is a hard job we do. We know what's going on. But it's hard when somebody's just driving it home," Roenicke said. Price, in the second year of a three-year deal, was elevated from pitching coach to manager when the Reds fired Dusty Baker after the 2013 season for failing to get the team deeper into the playoffs. The Reds won 86 games last season and finished ahead of only the Cubs in the NL Central. During their recent slump, Price — who was ejected twice last season — got thrown out of a game for causing a delay by refusing to leave the field. There is added pressure on the Reds to do well this season. They host the All-Star Game in July and want the team to be doing well when Cincinnati gets the national attention. AP sports writers Joe Kay in Cincinnati and Ben Walker in New York contributed to this report.